Wisdom teeth, also known as third molars, are the last teeth to erupt in your mouth, generally between the ages of 17 and 25. Often, however, the jaw isn’t large enough to accommodate them and they can become impacted. Wisdom teeth may grow sideways, emerge only part way from the gum or remain trapped beneath the gum and bone. Wisdom teeth only partially erupt. This leaves an opening for bacterial to enter around the tooth and cause an infection. 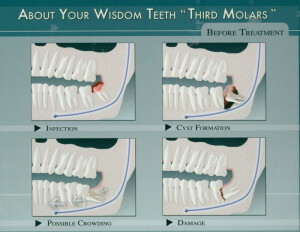 Pain, swelling, jaw stiffness and general illness can result. 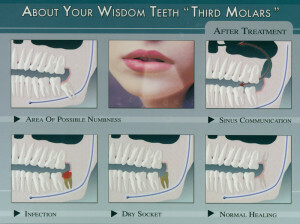 At McLean County Dental we offer intravenous sedation with wisdom teeth removal. Intravenous sedation involves the introduction of medication intravenously, usually in a vein in the arm, to achieve a relaxed, sedated state in which you are less aware of what is taking place. You are asleep but breathing and swallowing on your own. No tubes are placed in your throat.